Eight low-income families celebrate becoming first-time homeowners in San Miguel through Peoples’ Self-Help Housing’s home ownership program. View more event photos. 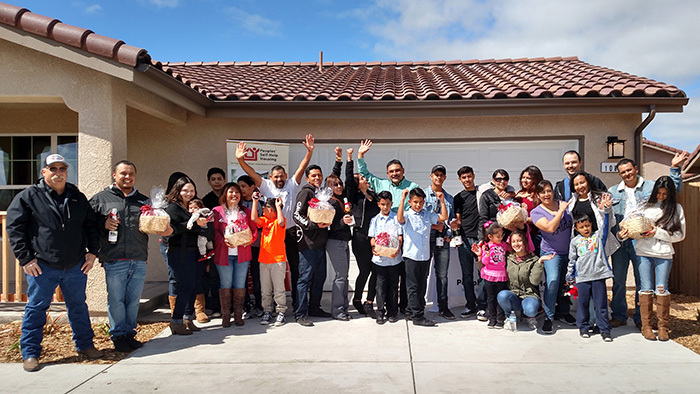 San Miguel, Calif., March 27, 2018 – A single mom, soon-to-be newlyweds, and parents hoping to give their children a brighter future are all first-time homeowners after successfully completing Peoples’ Self-Help Housing’s (PSHH) home ownership program in north San Luis Obispo County. “Today we are celebrating you and the hard work you’ve put into your new neighborhood and homes,” PSHH Chief Financial Officer Ken Trigueiro said during a small ceremony held Friday, March 23 recognizing each homeowner with a welcome home basket and keys to their new house. The nearly 48-year-old self-help program assists low-income families with the construction of a new home while also reducing the associated costs. Generally, groups of about 10 families work together under PSHH’s supervision to build one another’s house, reducing their building costs by 20-25 percent. Each family must contribute 2,000 hours of construction labor, which becomes “sweat equity” in lieu of a cash down payment for their house. “It’s really rewarding,” said new homeowner Pedro Arreola, “You really get to know your neighbors and build a bond.” Pedro and his wife Yesica, who was pregnant during construction, recently welcomed their second child. Each family member age 16 or older can help contribute to the required “family” labor hours to complete nearly all of the construction of a house with exception of the plumbing, mechanical, electrical, drywall, roofing and stucco work, which is all contracted to licensed professionals. Since its founding in 1970, PSHH has completed nearly 1,200 similar self-build homes in San Luis Obispo, Santa Barbara and Ventura counties. PSHH also provides owner-builders with education on home ownership responsibilities, loan qualification, applicable taxes, insurance and escrow and support and access to information and counseling after the completion of their house to help them be successful homeowners. Construction and mortgage funding is provided through the Rural Housing Service of the U.S. Department of Agriculture. This recent group of families is the second of three groups in the San Miguel subdivision located south of 11th Street. The first eight families completed and occupied their homes in the fall of 2017 and the third group is expected to be done later this year. Currently, there are 16 families working on houses in two San Miguel subdivisions. PSHH is accepting applications for 29 more homes in San Miguel. Applicants for the San Miguel projects are required to have a household annual income of at least $38,000 and no higher than $65,350 for a family of 4 or less or $86,250 for a household of 5 or more; good credit and rental history; commit to work 40 hours plus per week to build their home (most of the work is performed on weekends); and must be a U.S. citizen or permanent resident. The required application and instructions are available at www.pshhc.org (click on “Housing – Home Ownership”) or from the PSHH Office located at 3533 Empleo Street, San Luis Obispo, CA 93401, Monday-Friday 8 am-5 pm. For more information on the Self-Help Home Ownership Program visit www.pshhc.org or call (805) 540-2446.